Looking for an easy recipe for hash browns to cook for a Sunday Brunch? 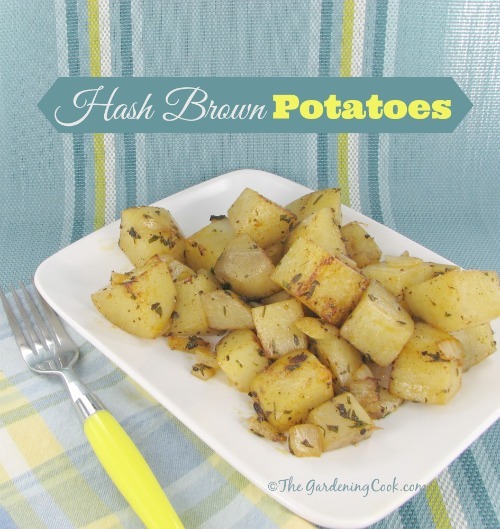 These delicious hash browns are so simple to make and the fresh herbs make them taste just great. Sunday morning is a special time for us at our house. We normally go out to eat for breakfast as a treat but this week was mother’s day and the restaurants are so crowded that we decided to eat at home and prepare the brunch together. Bacon and eggs were the star of the brunch and the hash browns compliment them beautifully. The bacon is baked in the oven, for ease of preparation and to reduce the fat content. A fresh fruit platter and wonderful jumbo bakery style chocolate chip muffins completed the meal. It was a lavish breakfast but we won’t eat lunch so the extra calories won’t matter. Are you a fan of Sunday brunch too? Mary Berry has a great cookbook for Family Sunday brunch recipes. It is available from Amazon.com. Melt the butter in a large 12 inch saute pan. 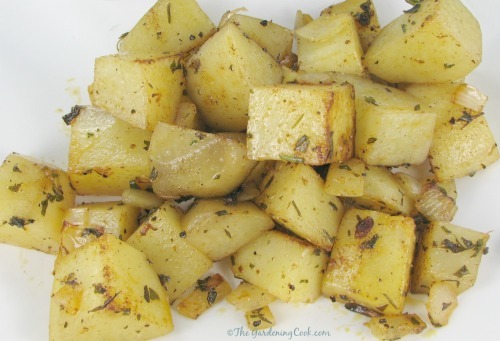 Add the potatoes, onions, salt, and pepper and cook over medium-low heat for 15 to 20 minutes, turning every so often, until the potatoes are evenly browned and cooked through. Turn off the heat and add the herbs and paprika. Serve with bacon and eggs for a great brunch..